The holiday season: loved by most children, and dreaded by many adults. As we’ve gotten older, the holidays just don’t feel the same. People may sometimes get excited over the snow and gifts, but it’s not quite as magical as it once seemed to be. The winter wonderland fantasy, for one, has lost its appeal. When you’re young, you always look forward to that first big snowfall. You knew that with that snowfall came the snowmen, snow angels, forts, ice skating and a nice cup of hot cocoa when you finally retreated back into the house. If you were really lucky, you may even have had a snow day. We always heard our parents complaining about the weather, but we never understood how anybody could possibly hate this beautiful season. That is, until we grew up. The snowmen and snow angels have been replaced with shovelling, and for those with cars, have been replaced with the dreaded driving conditions. It leads people to become more and more aware of soggy socks and frost-bitten toes every year. Let’s not even get started on how the wind dries up the skin. We never noticed these things as rambunctious youngsters, but now it’s all many people think about. Sure, it’s possible to appreciate the beauty of our city covered in a white blanket, but there is a limit. At least we can still warm up with a nice cup of hot cocoa, give or take a few shots of Baileys. Christmas itself isn’t quite the same either. During my childhood, I would lay in bed, practically shaking with excitement on Christmas morning. Nothing seemed more exciting than getting up on Dec. 25 and waking up everybody in the house at the crack of dawn. After months of anticipation (for those of us who eagerly prepared our Christmas list before the air even had a chill), we finally got to see what Santa Claus brought for us. Nowadays, it’s not unlikely to lay awake in bed worrying about our Christmas shopping or dreading our family get-togethers. The illusion of Santa has also long been shattered. We now know that it was our parents who waited for us to fall asleep to hide our presents under the tree. There is now the stressful responsibility of buying presents for everybody else—something we never had to worry about as children. While we may no longer jump out of bed at the crack of dawn, it is still fun to see what we got. Let’s be real, a present is a present. Child or adult, it is still exciting to be showered with gifts. It may not have the same feeling of glee as the old days, but who can complain? 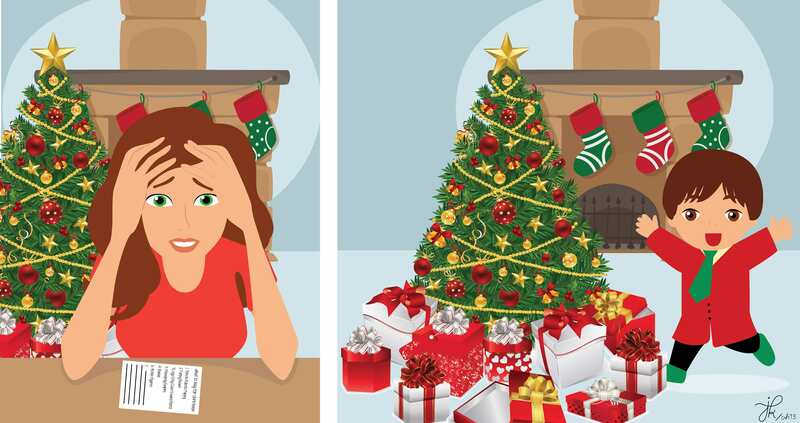 Adults and children may not perceive the holidays the same way, but that doesn’t mean growing up leaves nothing to look forward to. As cheesy as it sounds, now that we’re adults, we’re able to enjoy what’s truly important: family, friends, and the spirit of giving. When we were kids, all we wanted was to open our presents and play in the snow. Now, we get to be the ones who spread the excitement, whether to our younger family members or within our community. Isn’t that enough? If the feeling of spreading joy doesn’t warm your tiny Grinch-like heart, just remember one thing: now that we’re legal, we can have a lot more fun at holiday parties.